The Elle Sees headquarters is in full-on DIY mode--expect a few more DIYS in the next two weeks. And today I wanted to share my annual candle gift with you--this was inspired by a candle I got 10 years ago as a present. I loved it so much and immediately recreated my own--it was such a hit that I've been making them ever since. 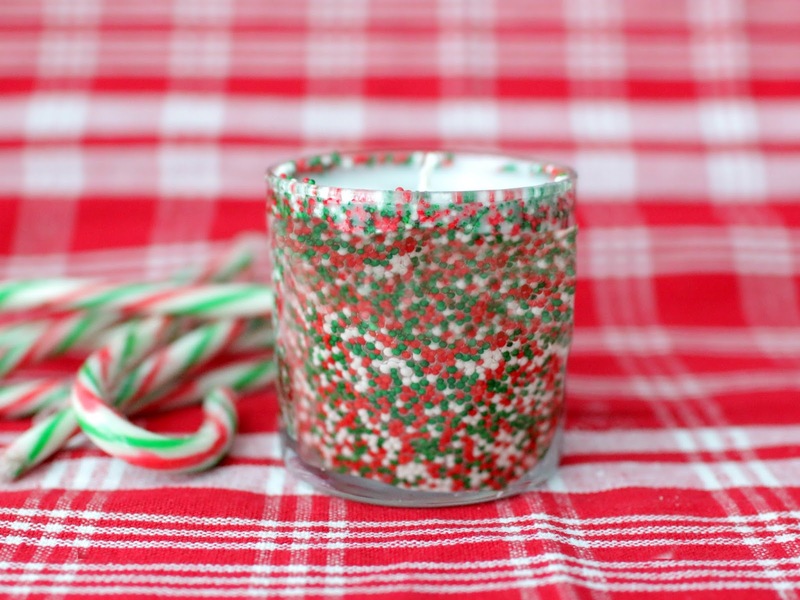 This sprinkles candle is Christmas-inspired and I think you'll be surprised at how easy this is to make. I've tried all sorts of things over the years to get the sprinkles to stay and the best is Karo syrup since it's clear. Coat the inside of your glass container with karo syrup. Since this was a votive, I used my clean finger, but for larger candles I use a brush. TIP: Reuse glass candle glasses to make these. Shake the sprinkles around to coat the sides. You can coat the bottom as well, but make sure the wick is in first. Dump out the excess sprinkles. Melt wax in an appropriate glass container (I used soy) and while it is melting, attach the wick to the bottom of the candle holder. Hot glue or some sort of glue will work well. TIP: If you have everything but the wax on hand, melt small tealight candles, just remove them from their metal holders first. Right before you pour, add in your fragrance and stir. I think I used a teaspoon of sugar cookies fragrance. I've used other Christmas scents too, like peppermint. Carefully pour in the wax to the container. 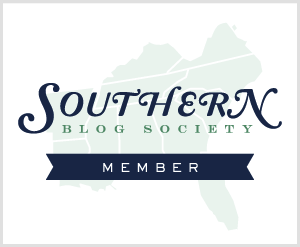 I suggest pot holders and using a glass measuring cup with a spout. I kind of eyeball how much wax I'll need so I can't give exact measurements since all containers are different sizes. Be sure that the wick stays up while pouring the wax. Allow to cool down. You can put these in the freezer to help speed up the process. As it's almost cooled at the top, you can add some more sprinkles on top for decoration. Sprinkles (jimmies aka hundreds-and-thousands work much better since they hold color better--nonpareils will blur together color once you burn the candle. If you don't coat the inside with enough karo syrup, the sprinkles will fall in once the hot wax is added. Always be responsible when using candles. Busiest weekend! Got my hair done--met niece and nephew to see Santa (they were in town visiting their family)--went out to dinner and a hilarious Christmas play--went to brunch with Atlanta bloggers--went to a pop up Christmas bar and it was so fun. You're holiday DIYs keep getting better and better! Love how easy this is to make and it's so cute! The pop-up Christmas bar sounds like fun! I love this candle! 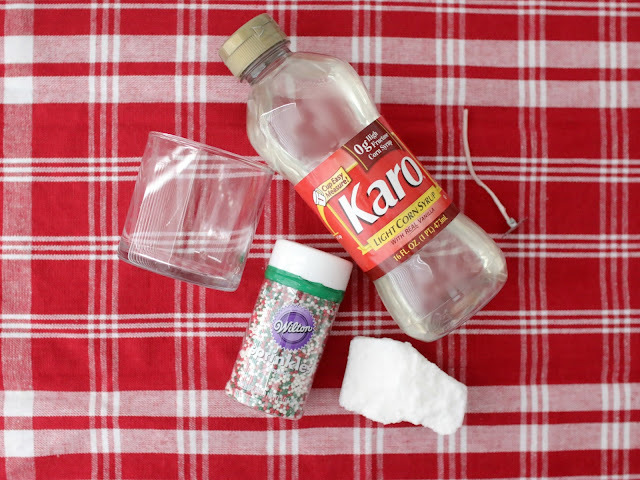 Thanks for sharing this festive DIY. Perfect for gifts! 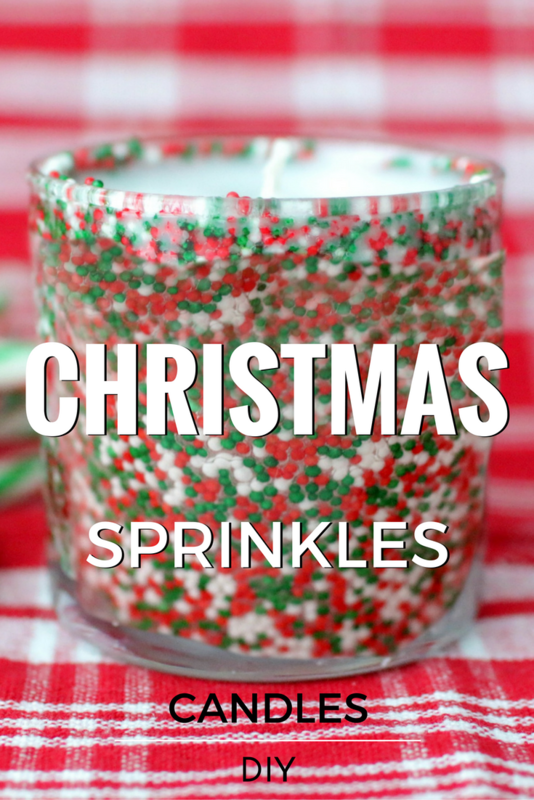 I never would have thought sprinkles would be used in a candle, but this is awesome! What a cute idea, Elle! I love that you could use these year round by changing the colors of the sprinkles too. You have the best holiday DIYs!! This is such a cute idea and makes the perfect decor or as a Christmas gift! I love candles so much. This is a fun idea! My husband and I make our own candles. You know the tiny bit of wax that ends up unmelted when you finish a candle? We melt those by putting the candle holders in a shallow pan of hot water. Then we add the wax to a very ugly layered candle! We also add our leftover wax from our wax warmer after the scent fades. How perfect for the holidays!!! Those would be adorable lined up on a mantle! Definitely trying these with the kiddos! This is adorable, Elle! You are killing it this year Elle! I saw this on my bloglovin feed and I was like yes, how come I never thought of it? You do DIY so good girl! What a great gift to make for a candle lover. Glad you had a nice weekend. A good way to use sprinkles. You make really fun DIY crafts. This is so cute and festive! You seriously always have the best DIY projects! 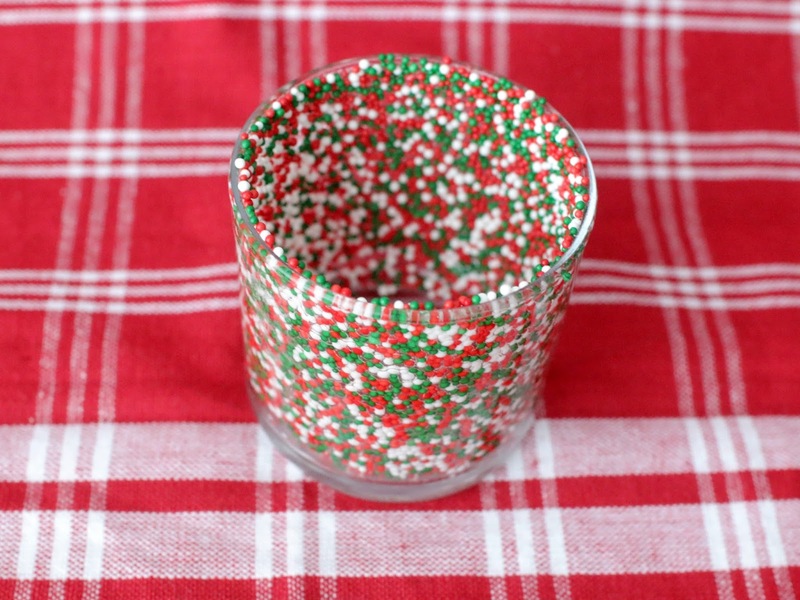 Not only is the candle festive, but it looks like it's so easy to make too! What a wonderful idea! I even like to save my burnt out candles and when I have enough similar scents I melt them together for a totally new candle. Definitely trying this idea next time! Ok you have the most fun DIY's, which I say every time! I love that you used Karo syrup, how creative! So great seeing you yesterday, what a fun afternoon!! This is seriously sooo cute! I love the sprinkles! I'm pretty sure this is the cuestest candle I've ever seen, and it might be my favorite DIY of yours! You seriously have the best DIY's! Love this candle idea! Such ad adorable, festive craft to try! I am always on the lookout for ways to reuse my old candle jars, there are just so many of them once you start burning the scented candles. This is so amazing. I love the sprinkles on the outside and the scent of sugar cookies too. Omg heavenly. YOU are the DIY queen, how fun is this!?! LOVE it! These are so cute! I did something similar for my friends for Christmas one year. This is super, super cute!! Love!! Thia is adorable! and so festive I wish I was creative as you! What?! This is the cutest DIY gift ever! Love! This is such a cute DIY project! So, so cute and simple! I love that you could do this with other types of sprinkles for other holidays, like Halloween, etc.! What a great DIY! Love how it turned out. This is such an amazing DIY! 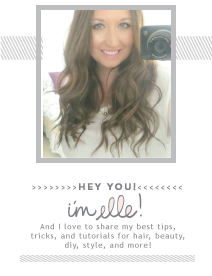 You are always so creative, I am eager to see the next DIY posts! I would never think of doing something with sprinkles and coating with Karo - you are really brilliant! And the result was really beautiful! This is so festive and fun! Great idea! I'm not much of a DIY person but that looks fun and festive and also such a cute idea.